ProLogis's vision for the expanded DIRFT. The planned units are to the top of the image. Work is set to start in the coming days on an extension to the Daventry International Rail Freight Terminal distribution hub, creating up to 9,000 new jobs. DIRFT III is a massive expansion of the rail hub site, and will include around 15 new warehouses and logistics buildings, new roads and roundabouts, and an extension of the rail line serving the site. Work is beginning on site this month, and the developers ProLogis say the first warehouses could be ready to be occupied at the end of this year. The new expansion site lies to the north of the current warehouses, between the M1 and A5, on part of the old radio mast site. Land on the other side of the A5 is earmarked for thousands of new homes for Rugby’s expansion. It will see 7.86 million sq ft of logistics and warehousing created. The DIRFT II expansion along the A428 towards Rugby. The rail arm already built over the A428 to serve the large Sainsbury’s unit will be extended over the A5 and into the new site. Chris Heaton-Harris, MP for Daventry, said: “DIRFT III is one of the biggest national infrastructure projects that will be getting under way this year in the whole country. “It will bring an estimated 9,000 jobs. That number of jobs coming to the Daventry area can only be good news for the whole constituency. “There are some issues surrounding DIRFT and the neighbouring communities that need to be sorted out. “Traffic isn’t really one of them as most of the vehicles try to get onto the motorway as soon as possible, so don’t pass through any villages. “What has become an issue is the parking of HGVs. The issue seems to be in Kilsby where lorries are parking in laybys overnight, and when they get full start looking for other places. I’ve been sent images of lorries parked in the most unsuitable places. “I think it’s a problem that should be relatively easy to solve. In modern logistics the last thing you want is for a lorry to be sitting still in a layby doing nothing. Cllr Reg Dunn, chairman of Kilsby Parish Council, said: “Parking was something I raised at the last Junction 18 Forum meeting we had. “There are three laybys where we have a problem; the one opposite the George pub in the village, and the two between Kilsby and DIRFT itself on the A5. There are a lot of vehicles parking there, and a large number appear to be the Eddie Stobart ones. “The Forum has written to the company asking them what is going on as their base at DIRFT is only a quarter or half mile away, and they should be able to accommodate these vehicles on site. “Parking is a problem around the whole DIRFT area, anyone who drives through at night will see most laybys are full of lorries. But the problem we face is that not all of them are vehicles related to DIRFT apparently. “You get drivers leaving the ports and doing their set hours, and it seems when they get to this area is when their hours are up, so they have to stop. “DIRFT is right by the M1 and junction 18 so a lot of traffic turns off looking for somewhere to stop. “The DIRFT III expansion includes a new lorry park, but ProLogis says this will only be open to drivers for firms based in DIRFT as it will be paid for by those firms. “So all the other vehicles passing through won’t be able to use it. “We need to find some way of providing parking for these vehicles. It seems Highways England only cares about the motorways and doesn’t think about the A5. 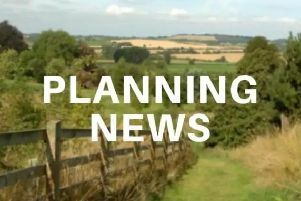 “We are going to see an increase in traffic, mainly due to the 6,200 homes Rugby wants to build just over the county border near the A428. We can’t really do anything about that because it’s in Warwickshire. “Another problem we face in Kilsby is lorries driving through the village itself – not the A5 and A361, but the small village roads – despite the fact we have a weight restriction in place. ProLogis say DIRFT III will be capable of dealing with 32 trains per day, and 500,000 freight containers every year. Proposals for DIRFT III were submitted in 2011, and approved in July 2014. Because of the scale of the development it was decided on under rules governing ‘nationally significant infrastructure projects’ and the final planning decision rested with the Secretary of State. DIRFT III will provide 8 million sq ft of rail served distribution space located in the ‘Golden Triangle’ formed by he M1, M6 and M42 – an area central to the UK with good links to the national motorway and rail networks, and a plentiful supply of workers. The original part of DIRFT opened in 1997, and was designed as a hub on both the road from Felixstowe port, and the Channel Tunnel for freight. DIRFT II was granted planning permission in 2005 with an extension to the rail link, and has since become home to large Tesco and Sainsbury’s distribution hubs.